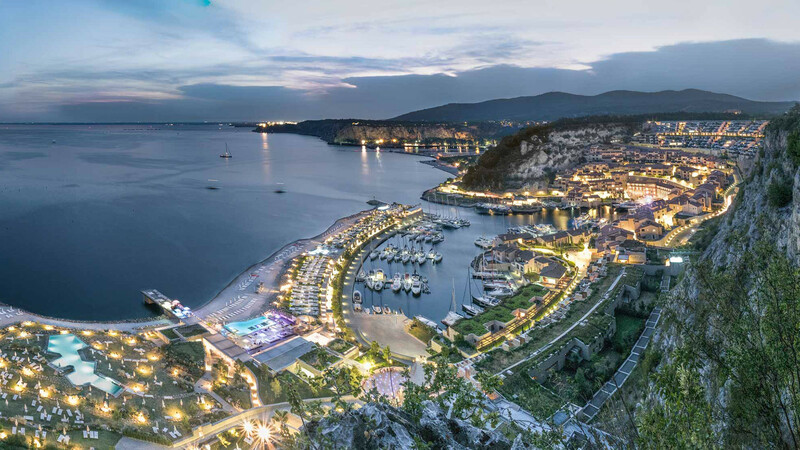 Porto Piccolo, a jewel set in nature, perfectly integrated into the splendid nature reserve of the Duino cliffs. The atmosphere that you breathe is that of the typical Italian village, made up of meetings, chatter and relationships. Recovered from an abandoned quarry in one of the most spectacular stretches of the Friulian coast, Porto Piccolo is a land full of history located between the castles of Duino and Miramare, overlooking the sea. Here you can still feel the artistic and cosmopolitan influence of Trieste, one of the most beautiful cities in the world, an hour's journey from Venice. The stone quarry where Porto Piccolo stands is from the II° century a.C. when for the construction of Aquileia two quarries were opened for the extraction of the stones. Around the seventies the quarry was abandoned leaving, in one of the most beautiful stretches of the Italian coast, a 35-hectare sea hole, 500 meters deep and 90 meters high. Since then several companies with their projects have succeeded but without getting to no results due to economic difficulties and administrative bureaucratic problems. It is only since 1994 that the entrepreneur from Mantua Carlo Dodi after buying this piece of land on the sea began the recovery of this area, using professionals in the area. Thanks to a generous and intact nature, it is possible to lead a life in the open air and practice a multitude of sports such as sailing, golf, mountain trekking, horse riding and canoeing regattas. In this oasis of peace and tranquility you can also taste numerous typical Balkan specialties of Trieste and Gorizia. In this wonderful setting, set in the cliffs, there are the terrace houses where the up and over garage doors have been installed to create a harmonious composition between the typical white stone of the Karst, the precious wood that covers the house and the same up and over garage doors Alet in steel. Our Alet doors are durable, non-deformable and elegantly designed. They are repeated in sequence also in the underground parking of the houses. For those who love a dream landscape and immerse themselves in nature, here is a series of houses set in the typical stone of the landscape. Up and over door, wood effect, in harmony with the typical white stone and the precious wood that covers the house. Always one of our best products, today in the new version MyFusion Viva 200. In some of the houses set in the stone the winged up-and-over doors have been installed. Alet is the most elegant door, with a modern design in steel, but not only. It represents the best compromise between privacy and aeration thanks to its finned mantle that does not allow to see inside the garage and at the same time also allows the renewal of the air. In the underground parking of the houses a series of alet up-and-over garage doors have been installed. Alet is a resistant, non-deformable garage door with an elegant design and that breathes thanks to the special contoured oblique edge of the mantle. Alet allows an aeration equal to about 40% of the surface, at the same time it prevents the view of the inside of the garage.